DESCRIPTION Located on the POPULAR HORMARE DEVELOPMENT on the edge of Storrington is this five bedroom detached family home with double garage and VIEWS to the rear over woodland. 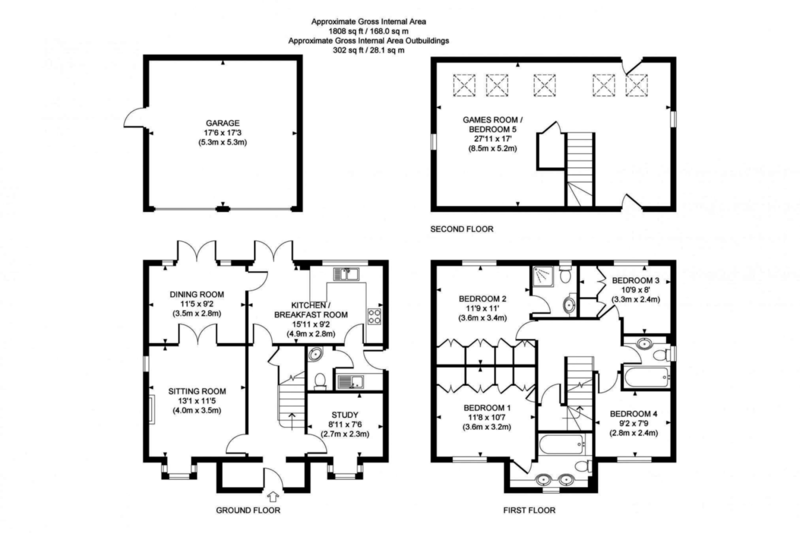 The property itself is arranged over three floors and consists of sitting room, dining room, study, good sized kitchen/breakfast room and utility room, with a downstairs cloakroom on the ground floor. To the first floor there are four bedrooms, with the master bedroom having an en-suite bathroom and fitted wardrobe cupboards, with the second bedroom benefiting from an en-suite shower room. There are two further bedrooms and a family bathroom on this floor. A staircase then leads up to the second floor with a generous sized bedroom and eaves storage. Outside there is off-road parking leading to a DOUBLE GARAGE, with a landscaped good sized rear garden backing onto WOODLAND. ENTRANCE HALL Covered radiator, understairs storage cupboard. DINING ROOM 11' 5" x 9' 2" (3.48m x 2.79m) Covered radiator, double glazed patio doors leading to raised terrace. UTILITY ROOM 5' 6" x 5' 3" (1.68m x 1.6m) Stainless steel single drainer sink unit with cupboard and storage space under, space and plumbing for washing machine, radiator, door accessing garage, wall-mounted 'Worcester' boiler, extractor. GROUND FLOOR CLOAKROOM Low level push flow w.c., wall-mounted wash hand basin, heated chrome towel rail, extractor. EN-SUITE BATHROOM Panelled bath with fitted shower attachment and folding screen, low level flush w.c., twin inset wash hand basin with toiletries cupboards under, extractor fan, double glazed window, shaver point. EN-SUITE SHOWER ROOM Fully enclosed shower cubicle with fitted independent shower unit, low level flush w.c., inset wash hand basin with toiletries cupboards under, radiator, double glazed window, extractor fan, shaver point. BEDROOM THREE 10' 9" x 8' 0" (3.28m x 2.44m) Radiator, uPVC double glazed windows. BEDROOM FOUR 9' 2" x 7' 9" (2.79m x 2.36m) Built-in wardrobe cupboards, radiator, double glazed windows. FAMILY BATHROOM Panelled bath with fitted shower attachment, part tiled walls, low level flush w.c., inset vanity wash hand basin with toiletries cupboard below, radiator, part tiled walls, extractor fan. BEDROOM FIVE/ANNEXE 27' 11" x 17' 0" (8.51m x 5.18m) Three radiators, five Velux windows, built-in shelved linen cupboard housing pressurised cylinder. ATTACHED DOUBLE GARAGE 17' 6" x 17' 3" (5.33m x 5.26m) Up and over door, power and light. REAR GARDEN Raised paved terraced area, steps down to lower shaped lawned area, screened by fence panelling and mature trees and shrubs, greenhouse, arbour with circular paved patio.